I enjoy taking stock to see how much the garden has grown and the changes that have been made in the garden each month so I'm joining Helen at The Patient Gardener's Weblog in sharing views of the garden for May. 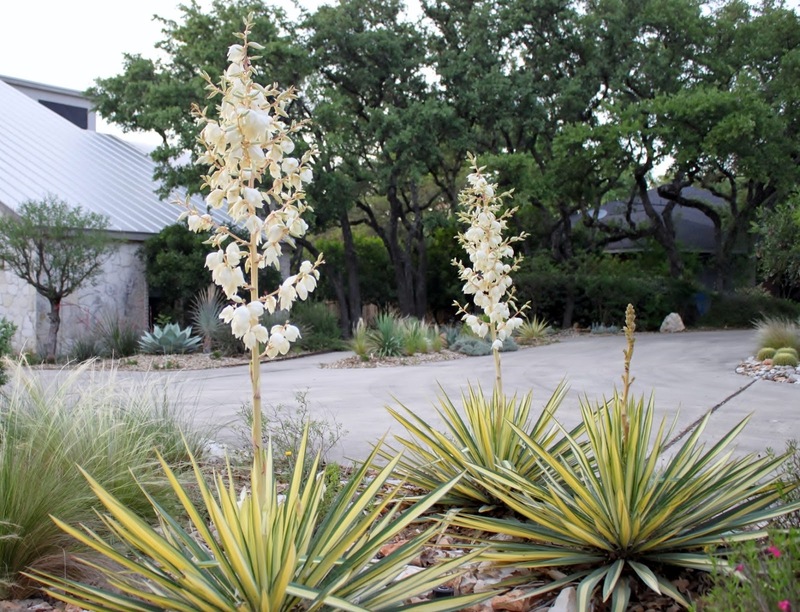 I usually begin with a view of the front garden where things don't seem to change much so we'll just skip to the driveway side where the yucca blooms have turned to skeleton forms. I like the effect at least for a few more days. The Texas Sage along the drive are just about to burst into bloom due to the recent rains. It's Wildflower Wednesday and time to join Gail at Clay and Limestone for a look at flowering native plants in the garden. May's wildflower pick is Stachys coccinea or Texas Betony. Looking for a deer-resistant native evergreen plant which covers a lot of ground quickly and flowers in the shade? Impossible? Not quite, that plant does exist and it's Texas Betony also known as Scarlet Betony and Scarlet Hedgenettle. It could easily rate the common name "Hummingbird Magnet" as many sites mention it attracts hummingbirds. Besides being evergreen it's almost ever blooming with just a short break in the coldest months and it's one of the earliest bloomers in my garden. There doesn't seem to be a mention of it attracting the Hummingbird Moth but the red flowers were a real standout in my early spring garden and the Hummingbird Moths made a beeline for those bright tubular flowers! The World War II Memorial in Washington, DC marks its 10th anniversary this Memorial Day weekend and the news had me going back through my photos to remember our visit there. 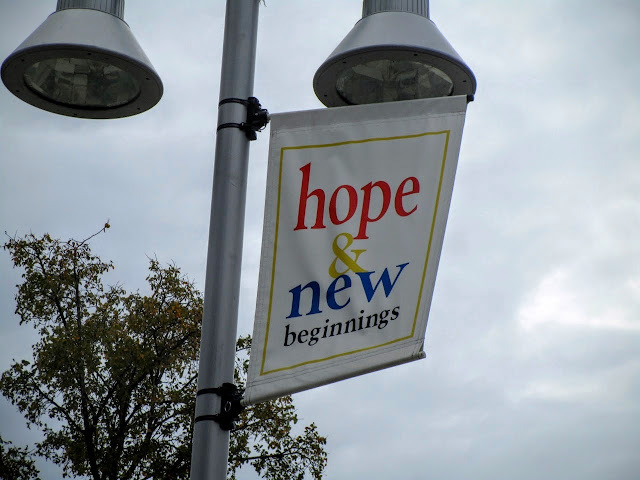 We lived in the Northern Virginia suburbs for a number of years and in April 2005, just a year after the WWII Memorial opened to the public, we headed out early one gorgeous day to see the famous cherry blossoms and explore the newest memorial. 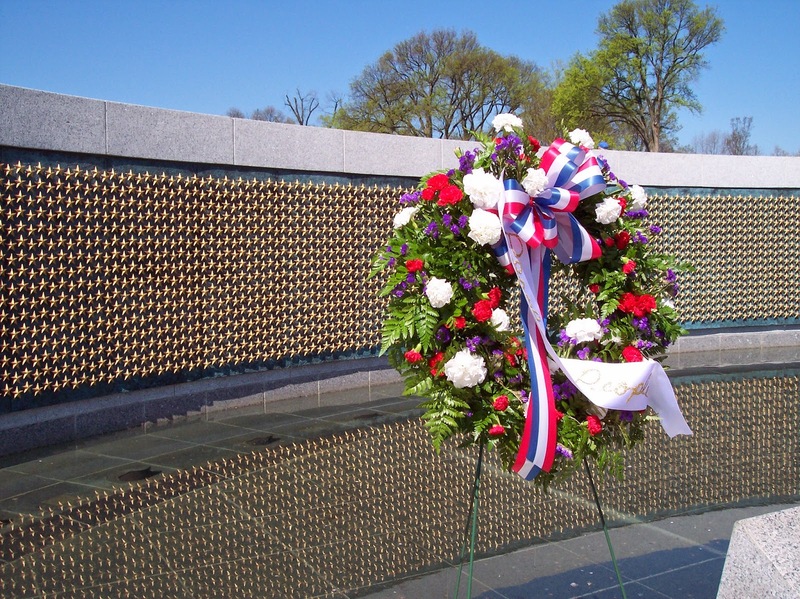 A wreath is placed in front of the wall of gold stars. There are 4,048 stars circling the memorial and reflecting in the pool with each star representing 40 lives lost in the war. Talk about a late comeback! How long would you wait for a plant to recover after a harsh winter? This year many of my plants have been slower than ever to bounce back. None has been slower than the Anacacho Mexican Orchid tree in the front garden, shown below after we planted it last fall. A week or so ago on Saturday I headed up to Austin with Heather of Xericstyle along with my friend and garden designer Linda Higby to meet up with the Austin bloggers for the Lady Bird Johnson Wildflower Center Gardens on Tour event. 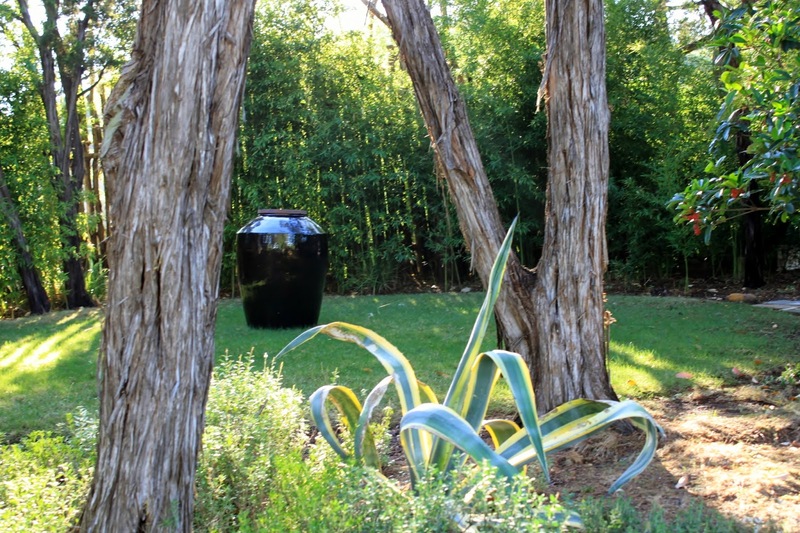 Our first stop was Landscape Architect Tait Moring's south Austin garden. Pam Penick had arranged early entry so we could get our photos ahead of the crowds and before the death star turned on full blast. So thank Pam for the good light in these photos. This was a great way to start off our tour. 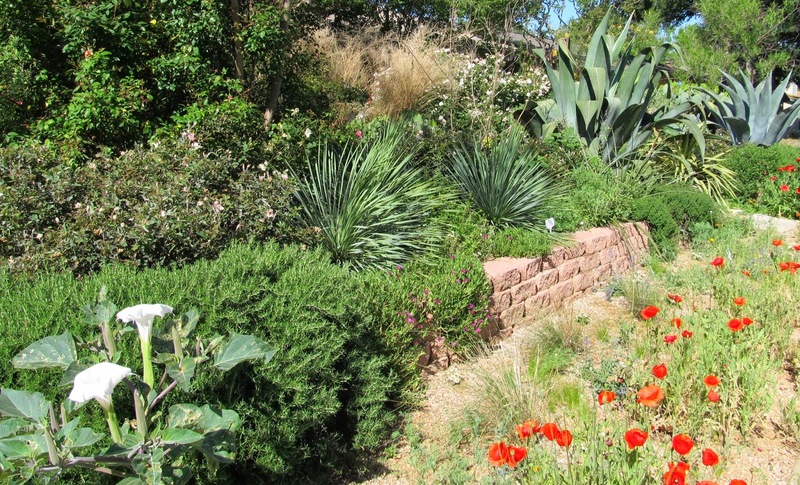 I remembered this garden from Pam's previous posts and reread them in advance, yet I was still surprised by how wonderful it was to visit this garden. The property is 22 acres along a busy road which fades away at first sight of garden spaces like this circular lawn visible from the driveway and bounded by bamboo to screen the traffic. It's Garden Blogger's Bloom Day and time to share the plants blooming in my garden. It's been a very dry spring in San Antonio but substantial rains in the last few days are helping out quite a bit. The biggest and best bloom surprises are these Color Guard Yuccas planted just over two years ago, which are sporting their first ever blooms. With more than 10 hours of direct sun a day during summer months these plants have grown to nearly four feet diameter in a very short time. The third bloom was caught on a leaf and is lagging behind. I will look forward to these creamy, bell-shaped beauties each year from now on. 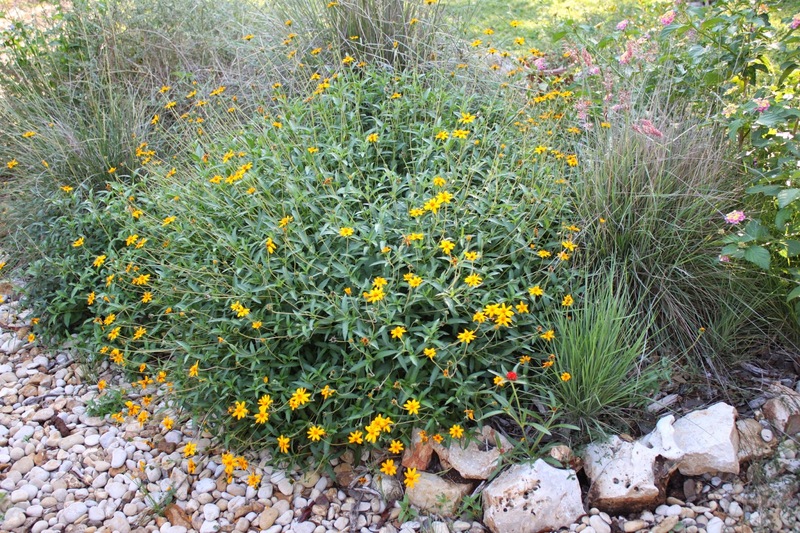 It's National Wildflower Week sponsored by the Lady Bird Johnson Wildflower Center and I'm celebrating with a post on the latest wildflower project in my garden. I call it the "Zexmenia Project". About two years ago I planted a native Zexmenia in the circle garden. Zexmenia is quite literally native to my neighborhood and I find it growing in many untended spots within walking distance so it was a natural choice for a native flowering plant in my garden. Blooming almost non-stop through our hot summers, it was a big success. It's a drought tough, heat tolerant, flowering plant and the deer do not even nibble on it. The only deer damage is if they happen to step on it. 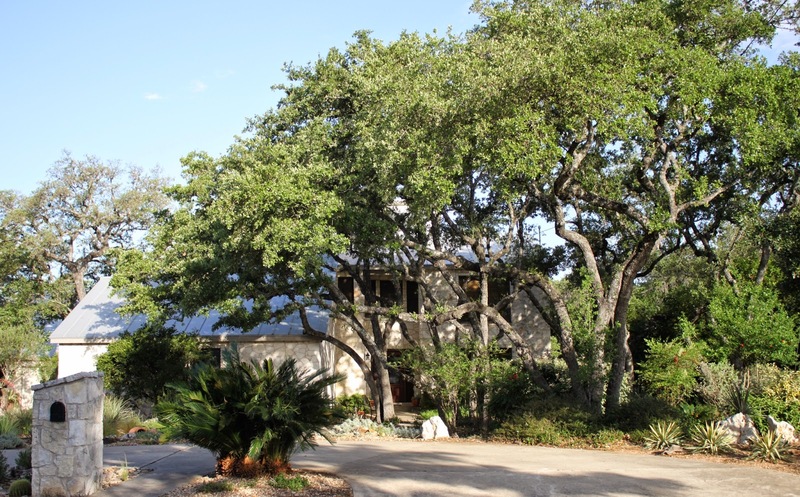 The Inside Austin Garden Tour is held each year by the Travis County Master Gardeners. 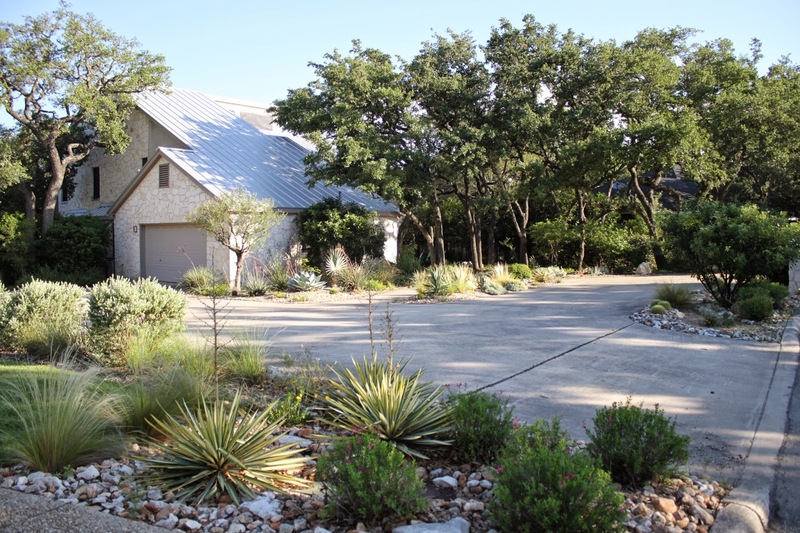 The chance to see Lori Daul's garden was a big draw for me to make the trip to Austin for this year's tour. I've seen Lori's garden on her blog "The Gardener of Good and Evil" and Pam Penick featured it on "Digging" last spring. Lori's garden was also recently featured on the local gardening program "Central Texas Gardener" so I knew we were in for a special treat when my friends Melody and Jeannette joined me on this adventure in garden touring. I look forward to looking back. What? I mean looking back at changes in the garden over the past month which why I'm joining Helen at The Patient Gardener for the End of Month View for April. We haven't had much rain yet this year but spring has brought a nice green-up and most plants have recovered from the exceptionally cold winter by now.